I’ve posted several things recently about cool stuff made out of old junk, and here’s another… Roger Wood at Klockwerks has expanded from making super-cool clocks to making super-cool menorahs out of old stuff. I LOVE stuff like this. I have several old parts of stuff that I bought at the salvage yard with this kind of thing in mind. 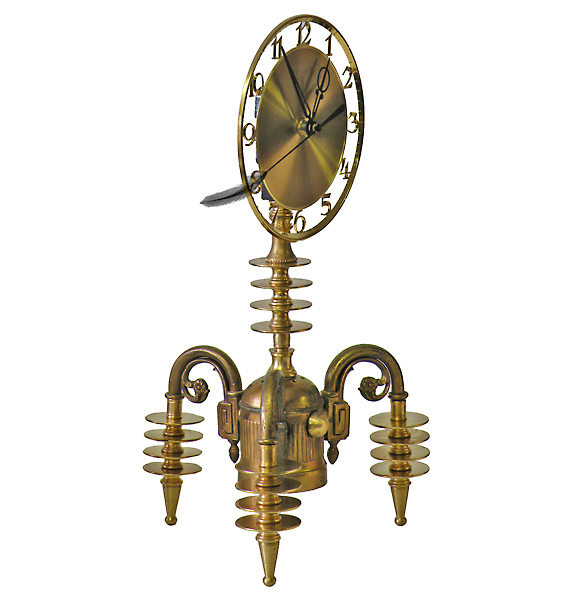 I love clocks, compasses, windmills, weather vanes, thermometers, barometric pressure measures, and any antique science thingy or doo-dad. At one point I was scouring eBay for monocles, science beakers, and glass eyes. Unfortunately, glass eyes are expensive. If I were going to be a sculpture artist (and I’d like to be) this is the kind of thing I would make; something cool looking but also kinetic. I need a workshop.